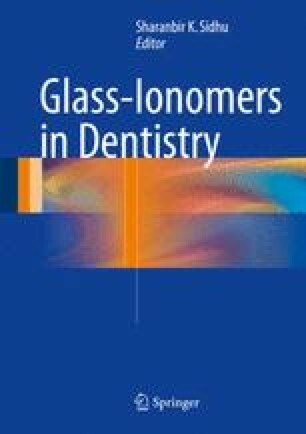 This chapter aims to discuss the evidence available to date from various laboratory and clinical studies about the use of glass-ionomer cements (GICs) in the management of deep caries. The contemporary minimally invasive approach to the operative management of cavitated deep lesions approaching the pulp relies on the selective removal of infected and/or affected dentine close to the pulp, followed by the use of a suitable adhesive restorative material to seal and bond to the underlying peripheral cavity margins/walls. In order to optimize the clinical outcome, an appreciation is required as to how this physico-chemical interaction occurs between GIC and sound as well as caries-affected substrates. The ionic transfer between GIC and tooth structure is described and discussed, with a particular emphasis on its anti-caries and remineralizing potential and also any effects, deleterious or otherwise, on the dental pulp when placed in close proximity to it. The clinical techniques available to restore teeth using high-viscosity GICs are outlined, including Atraumatic Restorative Treatment (ART) and the layered/laminate/sandwich restoration with resin composite. The findings of studies assessing the clinical longevity of such restorations in comparison to other direct plastic restorative materials are analyzed, both in the primary and secondary dentition. From the evidence presented, it is clear that GIC and its derivatives, whilst not perfect, have a major role to play in the minimally invasive restorative management of deep caries lesions.